(Nanowerk News) New nanomaterials for dental treatments boast impressive antibacterial, decay-resistant and biomimetic properties. In combination with stem cells, they are even capable of regenerating dental tissues. 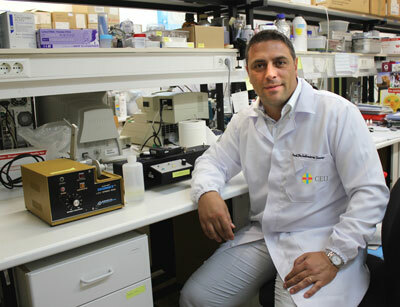 A researcher at CEU Cardenal Herrera University in Valencia collaborates on a compendium of the latest nanomaterials for use in fillers, mouthwashes, medicines and other treatments to improve oral and dental health ("Advances in Dental Materials through Nanotechnology: Facts, Perspectives and Toxicological Aspects"). Salvatore Sauro at CEU-UCH, Nanodentistry. In the past decade, some 151 patents for applications of nanotechnology within dentistry have been filed, indicative of the level of development of research in this field. Specifically, advances are being made in the diagnosis, prevention and treatment of oral and dental diseases through the use of potent nanomaterials that bring resistance, antibacterial and other biomimetic properties to oral care. In combination with stem cells, some are even capable of regenerating dental tissues. Salvatore Sauro, professor of Dentistry at the Universidad CEU Cardenal Herrera (CEU Cardenal Herrera University, CEU) in Valencia, has collaborated with experts from the College of Dental Medicine at Georgia Regents University in Augusta, US, and the Brazilian Universidade Federal do Ceará and Universidade Estadual de Campinas, on an exhaustive study of these nanomaterials and their clinical applications within “nanodentistry”. A detailed overview was published in Trends in Biotechnology, analyzing the cutting-edge properties of polymeric, metallic and inorganic nano-based materials and their potential use in therapeutic and restorative dental care. As Sauro underlines, “one of the most promising features of these nanomaterials is their capacity to imitate the natural physicochemical, mechanic and aesthetic properties of dentine and dental enamel”. This is what is meant by biomimetic: human-made materials that imitate nature and natural processes. “For instance, nanoceramic materials have yielded good results in dental restoration, imitating the aesthetic properties of dental enamel”. Some dental resins and composites used today to treat tooth loss have already been given the “nano treatment”, incorporating ceramic or silica-rich nanoparticles which, aside from imitating the natural aesthetics of teeth, they are stronger, harder and more resistant to decay. Stronger still are new nanomaterials based on sapphires and diamonds, which have proven twenty times as strong as their ceramic-based counterparts. “The field of dental materials is one that will feel the benefit of advances in nanotechnology on the short-term”, adds Sauro, meaning the door is wide open to restorative dental materials that are even more natural-looking, long-lasting and easier to work with in the clinic setting. Another area of development is that of remineralising and regenerating dental tissue, whose natural capacity for regeneration in adults is very limited. Nanomaterials are being used in conjunction with stem cells to regenerate dentin, dental cement and even enamel, the tissue least able to regenerate naturally. Incorporated into composites and injectable biomaterials, this is a promising approach to dental tissue repair which harnesses biological responses. However, Sauro warns that further testing is required to ascertain the toxicity of these materials, which may also affect the healthy cells in the treated tissue. In fact, given the rapid development of these new dental nanomaterials, it is still necessary to evaluate their effects on the oral cavity in general, taking into account factors like pH, buffer capacity of saliva, contact with the mucosa, and spreading of the dental tissues. “Many of the existing studies into the toxicity of these materials have been restricted to in vitro testing. More clinical studies are necessary to understand their effects on the long term”.